It’s refreshing to find a company that really knows its customer. Stemler Corporation takes their service to heart and makes it their mission to outperform the competition with the best service and the best products. Since 1925, this family-run business has been providing services throughout the Louisville, Kentucky and Southern Indiana area for professional and industrial plumbing needs. The history of Stemler Plumbing started with Frank Sr. who worked out of his home part time when not driving a school bus. Over 90 years and three generations later, Stemler Corporation now encompasses two businesses and 34 employees. Great-Grandson Steven Stemler now tops the organizational chart. As President and CEO of Stemler Corporation along with serving as an Indiana State Representative for the last twelve years, Steven Stemler has had his hands full. As an empty nester of two children and wanting to spend more time with his wife, they decided to create a beautiful sanctuary at their home in the form of an outdoor kitchen area. A beautiful stone fireplace with stainless steel appliances and other amenities made this oasis perfect, except for one little problem. Although the kitchen is enclosed, it is attached to the outdoor patio where Mother Nature likes to enter the area uninvited in the form of rain. It had become more than problematic with the area remaining damp from an outdoor rug and leaving marks on the brick indicating the depth of the rising stormwater. Stemler needed a solution to redirect stormwater away from the patio. 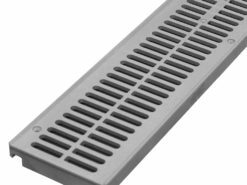 Being in the plumbing business, Stemler was used to commercial applications of trench drain, but was looking for a resource that provided drainage for residential products. He was looking for a solution that would be efficient and would not become an eyesore in what he and his wife worked so hard to create. 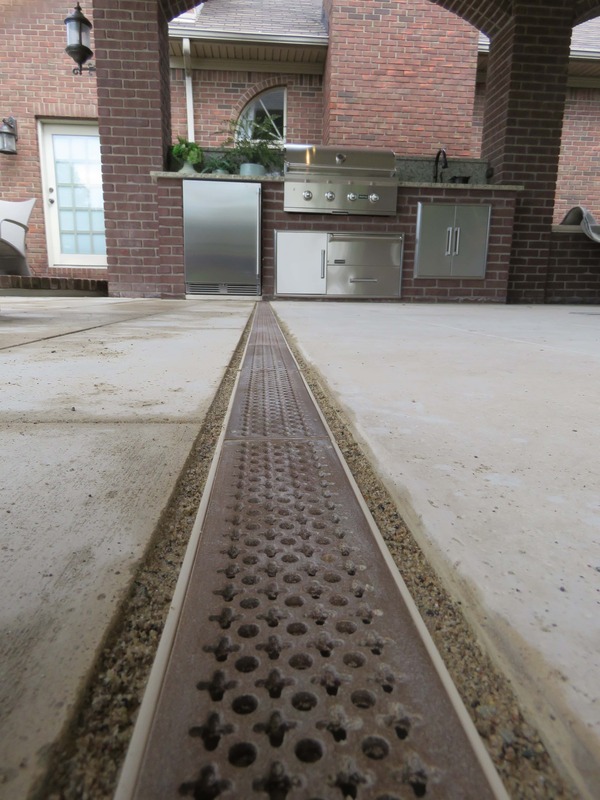 Stemler indicated that he “searched the internet and found Trench Drain Systems.” TDS Sand Mini channel with Natural Bronze Cathedral grates were the right touch to finish the outdoor kitchen giving a classic look to the application. Stemler contracted a concrete cutter to excavate a trench large enough to accommodate the channel since the existing surface was stamped concrete. Working for a plumbing and irrigation business makes it easier to find installers when they’re already under the company’s roof. Although Mother Nature tried to get one last soaking in during the installation, the trench proved its value by redirecting the rain even before the channel had been fully installed. Once the rain cleared up, the project was completed and topped off with the addition of the decorative bronze grates. Stemler was extremely grateful for the customer assistance and follow through of Trench Drain Systems staff members. Some of which were able to witness the installation first hand. For help with weighing your project options, call our experienced experts at 610-638-1221, or check out our online store by clicking here. Have a big job and need a quote? Click here.